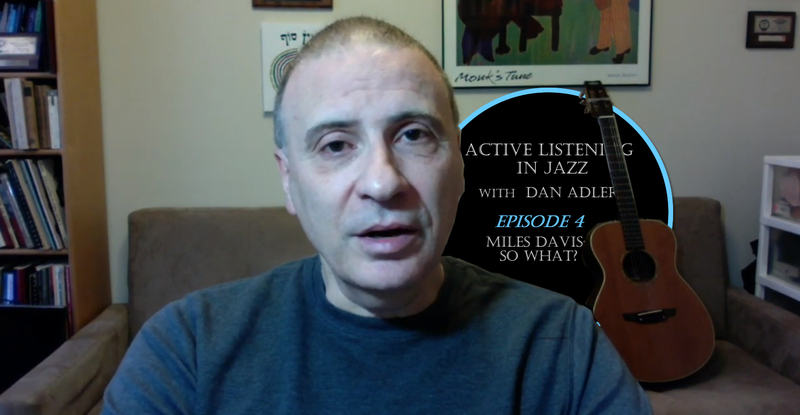 Hello everyone and welcome to Episode 4 of Active Listening In Jazz For Non-Musicians. This is Dan Alder and if you haven’t seen the previous episodes the link to the previous playlist should be below the video on YouTube. So I hope you check out the whole series. y to connect to what is going on within the performance. And like I said we talked about the Blues form which is 3 sentences of 4 bars each. And we went through that in some detail of 12 bar Blues: 3 sentences of 4 bars. 3 x 4 is 12. And that is a repeating form. the for of ‘So What’. ‘1,2,3,4 … 1,2,3,4 … 1,2,3,4 … now we went up a half step. Now we’re in the B part … ‘1,2,3,4 … 1,2,3,4 … 1,2,3,4 … back to the A. Last A … ‘1,2,3,4 … 1,2,3,4 … 1,2,3,4 … that’s the end of the form. Subscribe to the playlist to catch new episodes.